The clock's ticking and you have to get the kids ready for school and get to work. Who has time for breakfast? 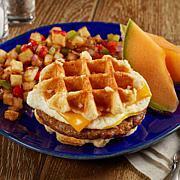 With Coach Joe's grab-n'-go waffle stackers everyone can have a tasty, satisfying meal in the morning. Listen to the Coach and take a bite and get your mind right! Due to the vents, once you remove our stackers from the box please store the remaining unused packaged stackers in a resealable freezer bag to prevent freezer burn. 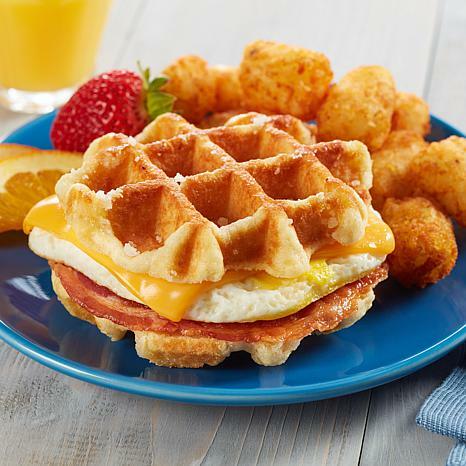 Ingredients: WAFFLES: Wheat flour, palm oil, sugar, water, whole egg, invert sugar, yeast, contains 2% or less of: ascorbic acid, beta carotene (color) dextrose enzymes, malted barley flour, natural flavors (milk), rice flour, salt, soy flour, soy lecithin, soybean oil, vitamin a palmitate. EGG: Egg whites, egg yolks, soybean oil. Contains 2% or less of modified food starch, salt, natural and artificial flavor (medium chain triglycerides, butter fat (milk), partially hydrogenated soybean and cottonseed oil, natural and artificial flavors, egg powder, annatto extract), xanthan gum, citric acid, water, EDTA. CHEESE: Cultured milk and skim milk, water, cream, sodium citrate, salt, sodium phosphate, sorbic acid (preservative), citric acid, artificial color, acetic acid, enzymes, soy lecithin. PORK BACON: Cured with water, salt, smoke flavoring, sugar, sodium diacetate, dextrose, sodium erythorbate, sodium nitrite. These are so incredible good. I wish they were on autodelivery! 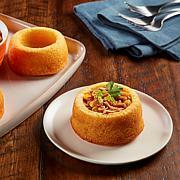 Do not hesitate to buy if you are looking for a quick breakfast. So yummy! I was surprised how tasty the stackers are. Waiting to try the other ones. Did not like, the waffle is sweet and not good for someone who cannot have sugar. i was so disappointed. the bacon was so thin that i could not see it. the cheese melted all over the wrapper. the waffle was gummy and wet plus there was some kind of sweetener on it. i will never buy any more of his products. 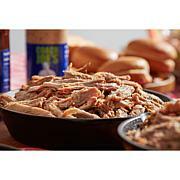 At dinner time, for a barbecue or just for a quick snack, Joe's pulled pork is ready to satisfy your family and friends. What You Get 2 lbs. 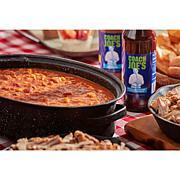 of Pulled pork Good to Know Shelf life: 1 year frozen Keep frozen.